Wiggins Lift Selects Volvo Penta Tier 4 Diesel Engines | Wiggins Lift Co., Inc.
We are proud to announce that we have recently chosen Volvo Penta as the preferred OEM supplier of EPA Tier 4 Final diesel engines for our line of industrial material handling machines. Our first forklift with a Volvo Penta six-cylinder TAD870 engine was deployed for stevedoring operations at Port Hueneme, California, and is performing admirably. More recently, we delivered a Marina Bull with a Volvo Penta four-cylinder TAD571 engines to Bolton Landing in the Finger Lakes of upstate New York. This week, another Marina Bull with the Volvo Penta will head for the State of Delaware. Volvo Penta’s after-treatment solution uses selective catalytic reduction (SCR) with cooled exhaust gas recirculation (EGR), which meets Tier 4F emission standards. The Volvo Penta solution for Tier 4 final is compact and does not require regeneration, resulting in less downtime and reduced maintenance costs. Although we are not yet required to meet Tier 4F emission limits, we have many customers who specify EPA Tier 4F, EU Stage IV and CARB compliant engines. We have tested products from other Tier 4F engine suppliers, and we selected Volvo Penta because of their superior emission-reduction technology, and their technical support and service. P.E. global sales support and special projects, Wiggins Lift Co., Inc.
At Volvo Penta, we are able to draw on the extensive experience of the Volvo Group in emission reduction technology for trucks, buses and construction equipment. Our SCR technology is mature and thoroughly proven over many years. 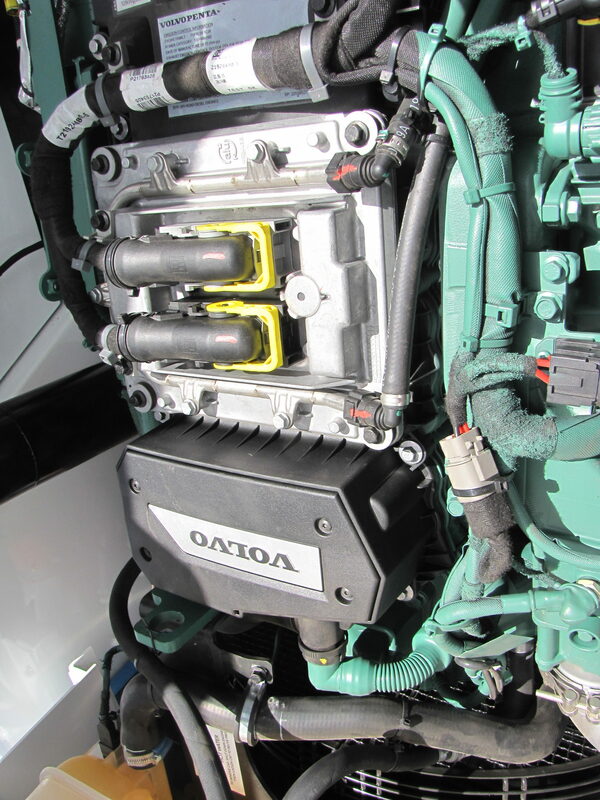 The Volvo Penta engines install relatively easily into our existing engine compartment without a major redesign. The Volvo engineering team provided prompt and efficient support, and the certification process was easy and painless. Customer service and satisfaction is also enhanced because Volvo Penta has servicing dealers close to our customers—especially at marinas and port facilities. Our customers have given the new engines positive reviews. They like the high power/torque performance at low RPMs, which provides better fuel efficiency and quieter operation.